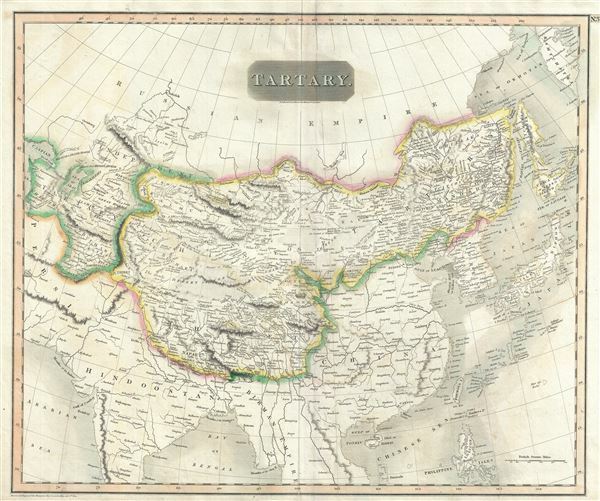 This fascinating hand colored 1814 map of central and East Asia, covering southern Tartary, Tibet (Tibet), Mongolia, and generally the whole of Central Asia. The area is named after the 'Tartars,' the Turkic and Mongol peoples of the Mongol Empire. The region covered extends from the Caspian Sea to Japan and Korea. Politically this map is configured roughly along the lines of the old Mongol Empire, with the territories controlled by the sons of Kublai Khan, based in Peking, defined as Chinese Tartary, and the territory to the west of Kashgar, modern day Kazakhstan, Uzbekistan, and Turkmenistan, occupied by various independent 'Hordes,' including the Great Horde, the Kirguses Hordes, and the Kharizm. The supposed site of the ancient capital of the Great Khan, Karakum, is noted in the Gobi. A portion of the ancient Silk Route caravan from Lok Nor to China is noted along with various caravan stops along the way. The cities of Bokhara, Kashgar, and Samarkand are also noted. The sea between Japan and Korea, whose historic name is currently a matter of dispute between the two countries, is identified as the Sea of Japan. Magnificent size, beautiful color, and high detail make this one of the finest maps of these central Asian nations to appear in the early 19th century. The whole is beautifully engraved in the minimalist English style pioneered in the early part of the 19th century. Relief is shown by hachure with towns, cities, and major topographical features identified. This map is a steel plate engraving and was issues as plate no. 37 in Edinburgh cartographer John Thomson's 1817 New General Atlas. Good condition. Original centerfold exhibits some light toning . Rumsey 1007.040. Phillips (Atlases) 731. Newberry Library: Ayer 135 T4 1817.